What's better: Letting my battery run out then recharging it, or keeping it constantly charged up? It's one of those age-old questions, how can I get my battery to work harder and last longer? Read on for all you ever wanted to know about the iPhone battery - and the answer to that dinner party question. All lithium ion batteries, whether it’s in your phone, or in your laptop, degrade with use and over time. That is an unavoidable fact of lithium technology today. This means if you discharge it, and then re-charge it, it’s going to degrade. This also means if you leave it on a shelf for a year, it’s doing to degrade. Also heat damages batteries, so leave it in a hot car one day, it’s going to degrade like you wouldn’t believe. Basically lithium ion batteries are constantly conspiring to expire on you, and you either accept that fact, or you become a slave to your battery and cater to all its exacting needs. So the question of “what can I do to maximize the battery capacity of the phone over time?” does have an answer, but it's something like: use your phone during the day until it’s at about 40–60% charge, don’t charge it, then turn it off and put it in the fridge overnight. This seems a little odd, but there's good reasoning behind it. And to understand that, we first have to get our facts straight about lithium ion batteries. And in doing so, well learn about the best practices for maximizing battery life too. So let’s get better informed and dispel some of the nonsense out there about this topic, shall we? 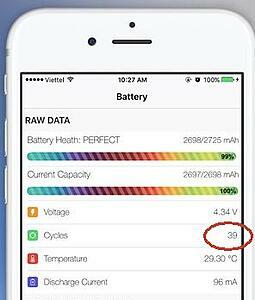 Part 1: Battery degradation due to "cycle life"
An often used convention for the overall life of the battery is the “80% capacity cycle life”, or the number of cycles until a cell drops to 80% of its initial capacity. How many cycles does the iPhone get? Apple states: Your battery is designed to retain up to 80% of its original capacity at 500 complete charge cycles. You can work out what your battery life should be if you take cycle life at face value and ignore all other effects. Part 2: Battery degradation due to "Depth of Discharge"
So does that mean there’s no degradation when I charge? Not so. The whole charge-cycle deal is more about making it easy for you to estimate how durable your battery is going to be; and for Apple it’s to help them enforce warranty exchanges. It’s only an approximation, or rule-of-thumb for what happens in reality. For a better estimate of degradation, you need to also look at how much you charge and discharge a lithium ion cell. So you can’t just count how much energy comes out of the battery like Apple do for their warranty above, you need to factor in the fact that lithium ion (and in fact most other battery chemistries) will wear faster the more you discharge it. 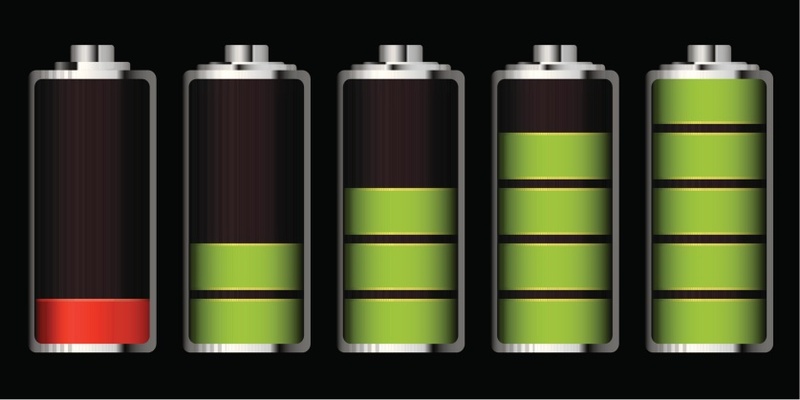 In that respect, batteries are a bit like muscles - you can walk for miles at an easy amble, but lifting weights will leave you tired out, even if you’re actually spending the same amount of energy. If you drain a battery all the way from 100% to 60%, and then charge it up again, you’re going to get about 500 cycles out of it. But if you only drained it from 100% to 80%, you’re going to get ten times more cycles out of it (but each cycle is only worth half the energy, but then again, that’s still 5 times more cycles per unit energy output). This means: by more frequently recharging, and not letting the battery drain, even though each cycle puts out less energy, so you’ll need to recharge twice as often, your battery will degrade 5 times slower! Apple’s 500 cycle life is therefore only an approximation. Apple probably did some studies or collected data about charge habits of their users, and then found a cycle life that matches the average DOD and other charge characteristics. This also means that if you do extra-deep DOD discharges, you’ll probably end up with fewer cycles than if you did light DOD discharges. Actually, I did mention earlier that there’s yet another factor at play here. Lithium ion batteries degrade anyway, even when not in use, known as “calendar aging”, and unfortunately the degradation depends on how much energy is stored. In that respect it’s a bit like not going to the toilet often enough - if you hold it in, it’s going to be bad for you. At room temperature, 25°C, a battery left at 100% charge will have a 20% reduction in capacity even if unused; while a battery left at the ideal storage charge of 40% will have a measly 4% reduction in capacity. What this means for your phone is: even though you’re using it throughout the day, this calendar ageing is happening in the background. If you left your phone plugged in all year round, then you’d expect calendar ageing at a 20% capacity reduction. Realistically, the phone might spend a third of the time at 100%, and the rest of the time at some degree of discharge, resulting in calendar ageing of maybe 10% a year. So to conclude, do you leave your phone charging all the time, or do you unplug it when it’s at 100%; do you let it fully discharge and recharge it, or do you keep topping it up? Well like I said, the optimum method would be to let your phone discharge to 40–60% to reach this ideal storage charge (which would minimize calendar ageing), don’t recharge it (minimizing cycles), and keep it in the fridge overnight (minimize thermal degradation). But frankly, you’re damned if you do, and damned if you don’t, so you might as well use your phone in whichever way seems most convenient for you, and when your battery gets too low, either consider an upgrade, or get a battery replacement. Ideally your battery will last more than two years and you'll be ready for a new phone anyway. VoicePlus solves enterprise mobility challenges. We enable productive agile teams by keeping people connected and we deliver measureable financial benefits by automating and securing mobility. Based in Sydney, Australia, VoicePlus has developed the Atrium Managed Mobility solution. Our customers include Coca-Cola Amatil, Downer, Citi, Compass, Hilton, Reserve Bank of Australia and many more.